Trichotillomania simply put, is a compulsive behavior which individuals have the repeated urge to pull or twist the hair until it breaks off. This includes, pulling out hair from their scalp, eyelashes, eyebrows, pubic area, underarms, beard, chest, legs or other parts of the body which obtain hair, thus resulting in noticeable bald patches. People who have Trichotillomania find it difficult to stop this behavior. In some cases, people who have Trichotillomania may also suffer from excoriation disorder or SPD (Skin Picking Disorder). With SPD, individuals are known to repetitively rub, scratch, pick it or dig into their skin. As with trichotillomania, exociation disorder is considered one of the many Body-Focused Repetitive Behaviors (BFRB’s) in which a person can cause harm or damage to themselvs or their appearance. Because of the compulsive urge to perform repetive behaviors, Trichotillomania and SPD are sometimes classified as a type of obsessive compulsive disorder. Who is affected? Trichotillomania is believed to affect about 3% of the population, and occurs much more frequently among adult women. However in children, both boys and girls are equally affected, and will usually appear in their late childhood or adolescence. In all cases, (adults as well as children/adolescents) increased levels of anxiety and depression often accompany it. What interventions work best? 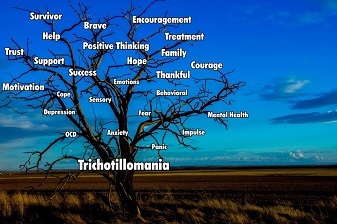 Treatment for trichotillomania will vary for each individual. However, the most effective treatment is a combination of various types of Cognitive-Behavioral Therapy (CBT). CBT is a form of therapy that seeks to alter behavior by identifying the factors that trigger hair pulling and learning skills to interrupt and redirect responses to those triggers. Broadly stated, CBT is based on a learning theory which has shown that as we practice new behaviors and thoughts in response to familiar emotions or situations, our brain’s physical structure actually changes, too. Thus, we develop new neural pathways and, with repetition, the new behavior becomes an automatic response. Where can you go for help? Speak with a therapist. Types of therapy that you may benefit from include but not limited to: Behavioral therapy, especially habit-reversal training, psychotherapy, and cognitive behavior therapy.